This is a blade that has extraordinary touch and godly control. It does everything well. In the hands of a skillful advanced player, this blade can be very fast, it can also be as slow as you please and everything in-between. I have used over fifty blades from different manufacturers and this is the best one by far. This blade maximizes all my strengths and is forgiving with my weaknesses. It is the best OFF blade as far as I am aware. PM me if you have any additional questions. I just received my second InnerForce ZLC blade this morning. It weighed in at 79 grams! I re-calibrated my scale and triple checked it, so this is an accurate weight for the blade. The reason I triple checked it is because the first InnerForce ZLC I received just last week weighed in at 84 grams. That is quite a difference. Not sure why there is so much fluctuation. Both blades have outstanding playing characteristics that suit my style of playing perfectly. 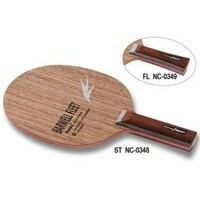 Just thought I would share with the rest of my table tennis friends. Crisp feel, do everything blade. 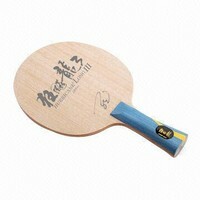 Large sweet spot, variable speed and great control which depends on the skill of the user as does the spin. Makes many different rubbers shine and brings out the best in most of them. I put it in my right hand and it becomes my hand. More gears than most blades; can go from very soft and slow to very hard and explosive in a heartbeat. Nine plies means lifting underspin is very easy. Touch is unbelievable. The entire blade is one sweet spot. When using hard rubber as I am, one needs to be mindful of their racket angles and brush the ball precisely. With Joola max thickness rubbers on both sides weighing in at 51 grams each, the blade becomes head heavy which I actually like. Handle is wide and comfortable. It fits my hand perfectly and I am 6'2". The neck of the blade is wide and the ergonomics are carefully designed for maximum playability and shot making potential. My blade weighs 76 grams. The handle fits my hand better than any other blade I played with recently. The blade/neck transition as well as the thumb rest are perfectly made for my hand. 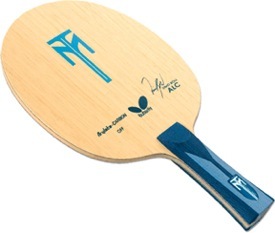 Blade is top heavy with Tenergy 2.1 mm rubbers on both sides. Build quality is good although not as good as Nittaku and/or Butterfly. The blade has enough speed and power from any range. Hit with proper and correct technique and this blade will fire bullets. 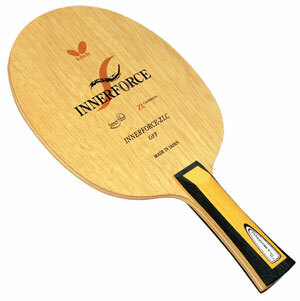 Lifts underspin so easily, I really have to adjust my strokes when playing with it. 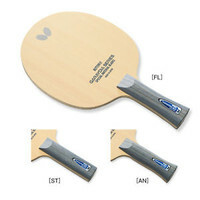 Light weight provides superior head speed and thus more spin than any other blade. The control is godly. From touch shots, to blocks, lobs and direction/speed/spin changing loops the blade is unreal and unrivalled. Most satisfying blade I have ever played with, bar none.